After a few months, I had another Hunter x Hunter related dream to share with you. This is far from the first dream I experienced (HxH Dreams - Main Four vs Genei Ryodan) but it's as bloody and as scary. In my dream, I was invited as a VIP guest to witness a rumble of characters from different anime series. I accepted the invitation and dressed up for the event. It was a huge mansion and everyone is excited to see the upcoming brawl. When the battle had started, I went to the dining hall to eat and meet a few people. The rules of the event were discussed and one of those that I can remember is that, the anime characters are prohibited to touch, harm or kill the guests and other audiences regardless of what's happening otherwise they'll be blasted off. Afterwards, me and my acquaintances decided to roam and see what happened in the contest. We picked up our tabs (provided by the organizers of the event) and brought it along with us as we go on different places. The first room we visited was a poor lit room. The tab notified us that something happened in this area. It said that someone was killed inside. We searched for some bloodstains and we found a mutilated head which belongs to Yagami Light (Deathnote). 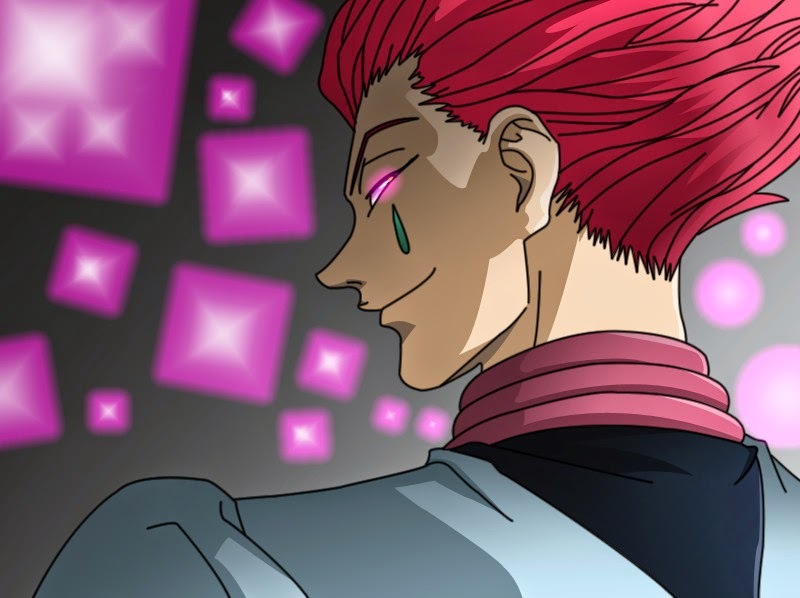 The tab told us that he was killed by Hisoka. Three of the cards were slightly buried on the head and it looked like Hisoka made it look like a crown. I was a bit shocked because of what I saw. I never thought that Yagami Light would be included to fight against characters with superhuman strength and abilities. We moved forward and found ourselves outside the mansion. It was a huge battlefield and we witnessed dragons and other creatures flying around. I can hardly remember their names or what they are called. Later, we've found Illumi Zoldyck on his knees. He was wounded with his fight with Kite. I also saw Neferpitou (with black hair) talking to someone else (I can't remember who) and his/her attitude was far from the anime series. Looks like he/she has no concern to the King who did not appear in my dream. He/she was only there to fight for our entertainment. Before my dream came to an end, a report was announced about the remaining survivors. I saw Hisoka, Illumi, Kite, a few armored men I couldn't recognize and some anime guys I couldn't remember. The funny thing was that I saw some dinosaurs who survived the round. The Pokemon Rhydon, Gengar, Jigglypuff and Alakazam were also there. Weird. Looking forward for a part two of my dream.